We are expanding our Modules section, and today we want to introduce a new module that has been asked for by our Premium users – it will help to work with bigger amounts of data and larger tables. This is how default Datatable looks like. It looks cool when you can search and order instantly, but the problems arise with more data in the table. For thousands of rows it starts to really slow down. But that’s natural – after all, it’s loading all thousands of rows and creates pages for the slices. Another way of doing that is to load the data in AJAX way – so load the table first and then have an API call to get the exact set of data you need – whether it’s the first page of the table, search query parameter or some other filter. 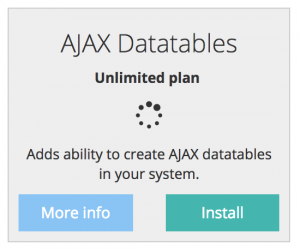 So that’s what you can do now in QuickAdmin – it’s in a new module called AJAX Datatables. This module is available only for our Unlimited plan customers – we believe they work with bigger amount of data. Have fun using QuickAdmin with bigger tables! If you haven’t yet, try it now for free. Great feature ! And certainly an essential one. One other thing you might consider is to add responsiveness to the tables (by adding for instance the class dt-responsive to the table and loading the needed responsive js and css files). A really important addition indeed. Well done! This module sounded like it did more than change the way the data loads. I thought, being AJAX, it allowed updating data in rows one field at a time. I should have read this before I signed up.